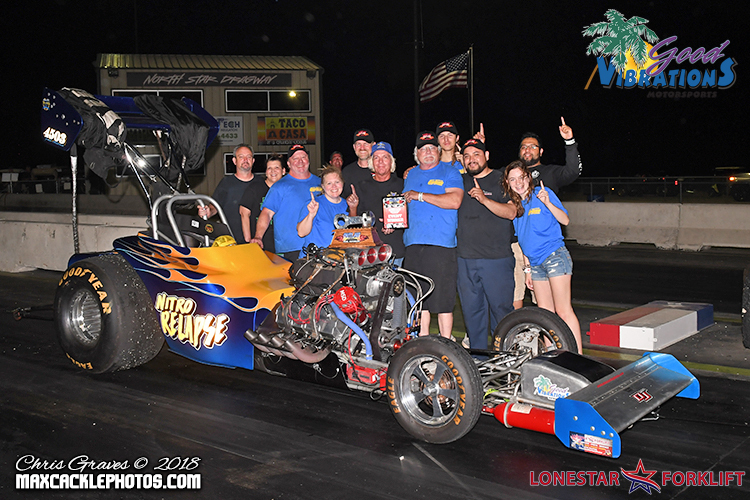 The second stop on the 2018 Good Vibrations Motorsports / Lone Star Forklift Outlaw Fuel Altered Association tour led the series through the gates of North Star Dragway in Denton, Texas on Saturday, May 12th. Under fantastic weather conditions, a rare sight this spring in the southwest, the fans packed the stands for a firm dose of nitro and wild fuel altered action. Also included in the line-up was the SHRA nostalgia brackets and Old School Backhalf racers as over 100 racers were on the property. 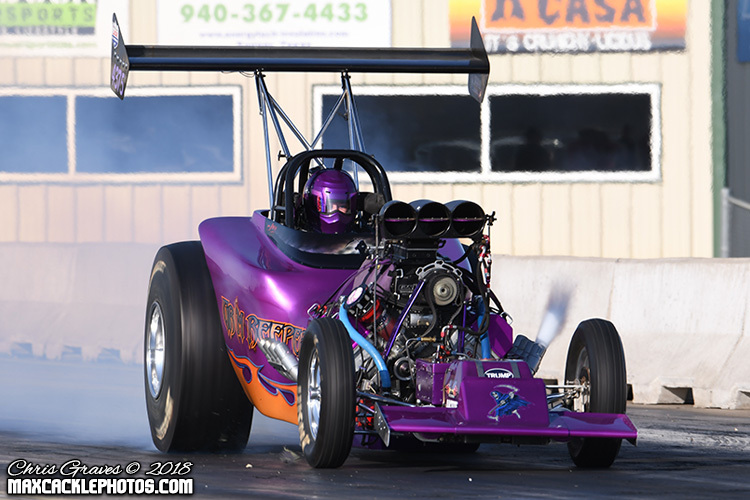 At the season opener back in March at San Antonio Raceway, OFAA rookie Aaron Morrow impressed the competition with a strong runner-up finish to multi-time champ Jimmy Jones. With sixteen cars on the property, the pressure was on as the call went out for qualifying to get underway. The event started with an emotional tribute pass to Gil Moore, who spent many years crewing for Raymond Dawson and the "High Octane" entry. With the OFAA racers and crews gathered on the starting line, Dawson ripped off a 3.93 at 172 mph solo shot. Jimmy Jones found himself atop the standings at the conclusion of qualifying with Ken Singleton in second and defending series Champion Nick Poloson a comfortable third. This marked the first event for the OFAA to implement the "luck of the draw" pairing system for first round. Qualifying position is still critical as points implications there could play a pivotal role in the Championship hunt, but this new elimination pairing process added a little more fun to the show and some very interesting match-ups developed as the teams prepared for first round. Unfortunately, Bobby Marriott and Mary Reep were both sidelined with damage resulting from severe tire shake. Additionally, Raymond Dawson made the highlight reel with a massive wheelstand where all four tires came off the ground, on his second qualifying run. Tire shake broke the wheelie bar in the first qualifier, a quick weld between rounds didn't hold and at the hit of the throttle Dawson went airborne. The resulting slam back to Earth crumbled the front of the car and bent the chassis. Reports indicate Dawson is unfortunately done for the year as the re-building process will be a lengthy one. 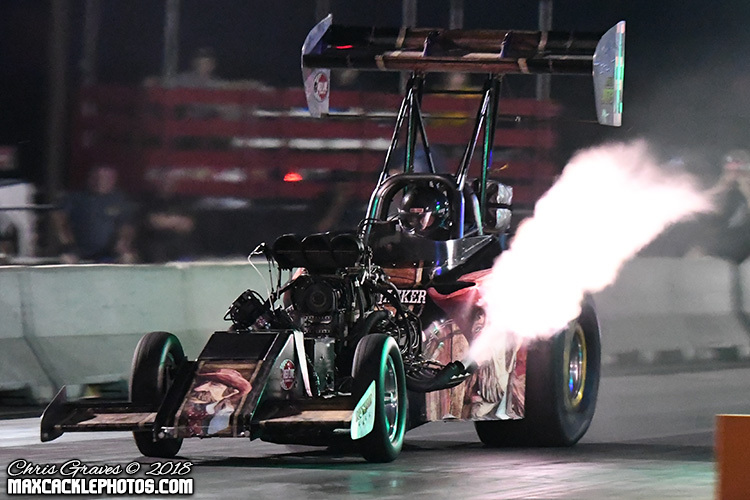 First round eliminations blasted off with powerhouse nitro match-up between the defending Champion Nick Poloson in the Tom Wood tuned "Sundown" and most recent runner up Aaron Morrow. Morrow was in just his second OFAA event in his first year behind the wheel of Terry Darby's "Nitro Relapse". 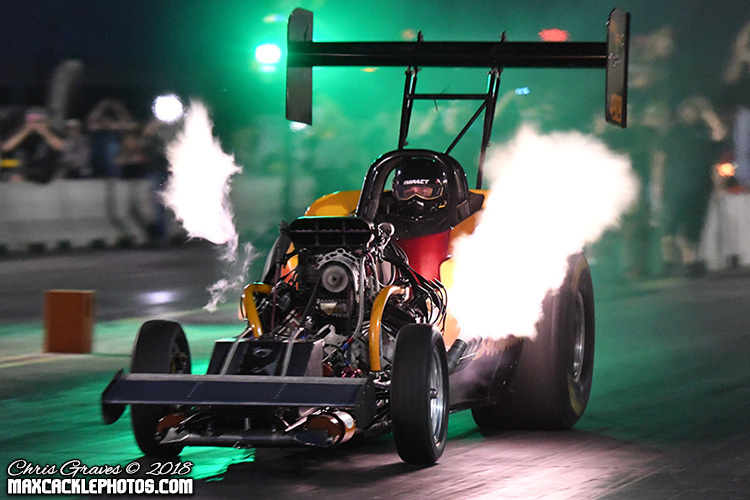 The nitro fumes were thick and flames were belching from the pipes as these two drivers pulled into the beams. Poloson took a huge advantage off the line but soon after made a violent and sudden right turn, barely crossing the centerline while Morrow blasted by to a stunning 3.80 at 190 mph. Wow, just wow, what a pass! 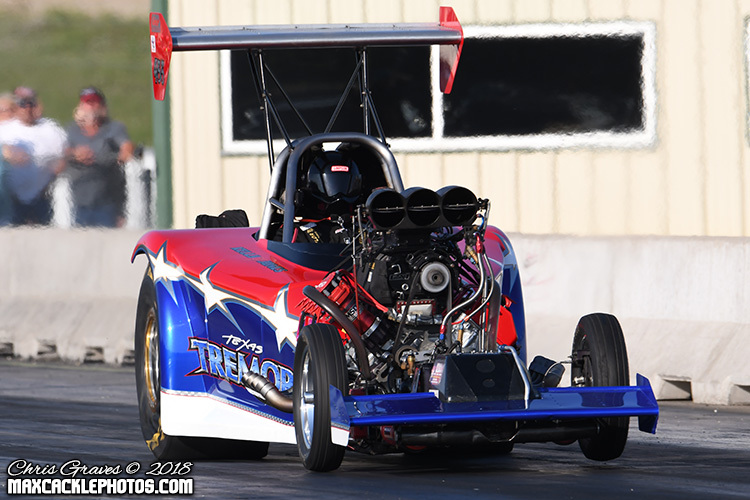 Donny McSwain's "Wild One" alcohol burner lined up next alongside Mark Hunter's nitro burning "Jailbreak" entry. McSwain was off the line first and never trailed with a 3.93 at 185 mph to Hunter's 4.30 at 115 mph. The luck of the draw pairings made things interesting as the top two qualifiers drew each other as Jimmy Jones and Ken Singleton pulled out next. Jones' car sounded ill from the start and by the time he had backed up from the burnout, ignition or fuel troubles were apparent and he shutoff. Singleton ripped off a winning 4.21 at 145 mph. Randy Mueller stole one in the next pair as John Broussard was forced to shut off after his burnout and Mueller took the win with a 5.61. 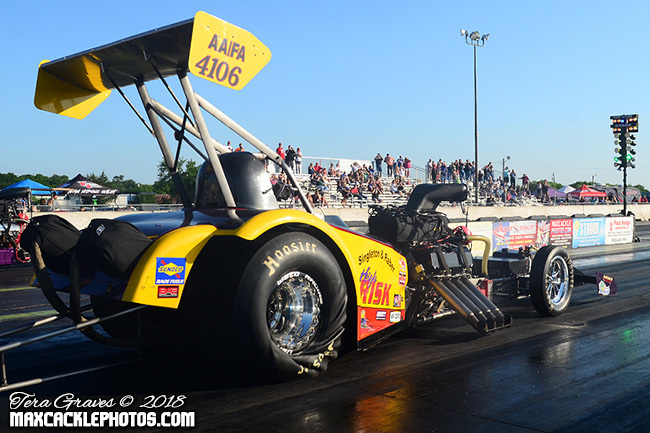 Clint Cross and Donnie Massey were out next in an all nitro affair. Cross coming into eliminations hot off his best qualifying effort in several years in the Allen Meyer tuned "Crossways" while Massey was back in action after an engine explosion at the season opener. Cross had this one from start to finish as his 4.07 at 180 mph held off Massey's 4.21 at 168 mph. In the final pair of first round, Jody Austin's "BushWhacker" lined up with teammate Mark Billington in Raymond Austin's "Magic Dragon". Another all nitro pairing killed off whatever mosquitoes were left flying as the nitro fumes were pumping heavy. Austin blasted off the line first and never looked back with a clean 3.89 at 146 mph to take the win and advance to the final round as one of the two quickest winners. Austin would face Morrow in the last dance as this marked Austin's first OFAA final round appearance, while Morrow was headed to his second straight final in just his second career start. 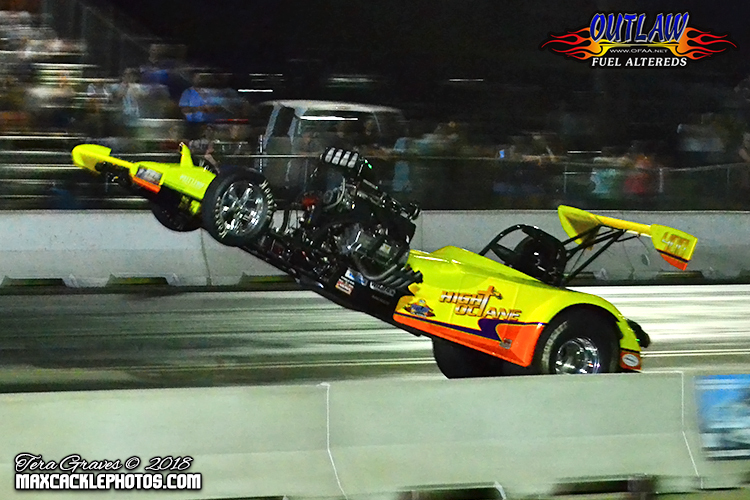 Two bad to the bone nitro burning fuel altereds came to life in the last pass of the night at North Star Dragway. We were guaranteed a first time OFAA winner in this one as the burnouts got underway. 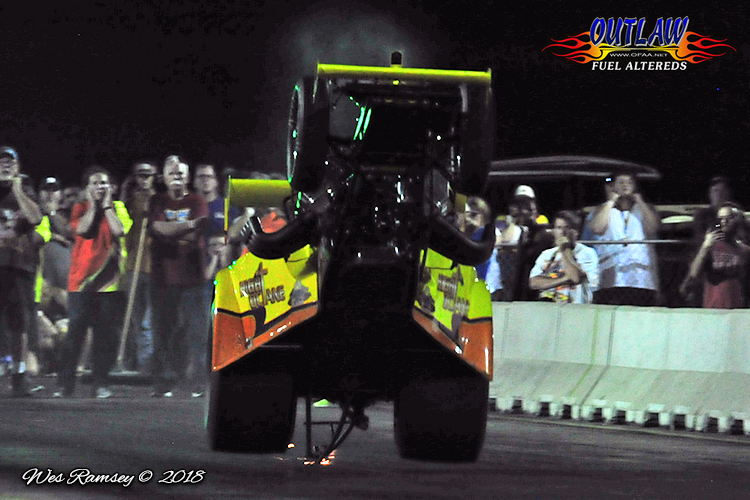 Austin was ready for the challenge as the ambers dropped and he blasted off the line with a .052 reaction time, but about 200 feet out Austin's car made a wicked move to the centerline as the flames went out and cones went flying. Morrow made it look easy as he streaked down the middle of the groove to a 3.85 at 188 mph to score his first career win. We're talking first win, ever! 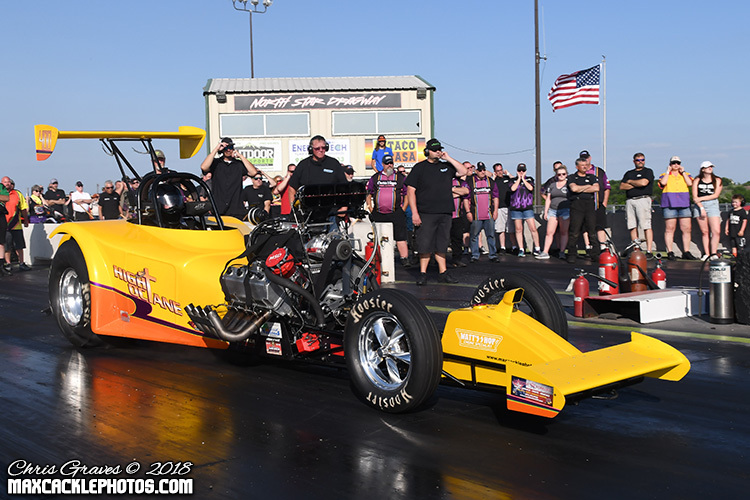 Morrow dropped into the seat of this nitro burner with no previous experience driving, not to overlook his many years of experience crewing on the "Blue Max" nitro funny car for father in law Ronny Young. What a weekend for both finalists and congratulations to both teams on a strong outing. For Morrow, the impressive rookie season continues and team owner Terry Darby was all smiles in the winners circle. 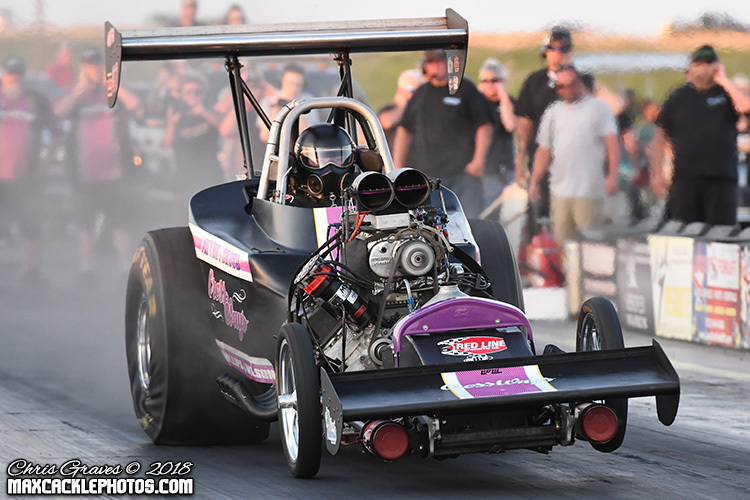 The Outlaw Fuel Altered teams will have a short break before their third stop of the year as they head north of the Red River to Thunder Valley Raceway Park in Noble, Oklahoma on Saturday, May 26th. The OFAA would like to thank Good Vibrations Motorsports, Lone Star Forklift, Wizard's Warehouse and Meyer Enterprises for their support this season.